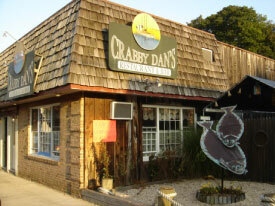 Crabby Dan’s is a friendly neighbor eatery where the ocean provides the main course. It is decorated in shades of green with lace curtains. 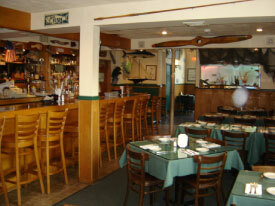 The mounted fish, harpoons and nautical memorabilia add to the warm and inviting ambiance. The large, colorful aquarium will be sure to amuse the kids. 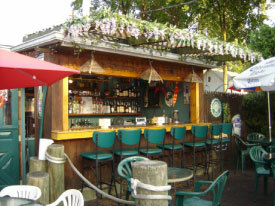 The Tikki Bar is a great place to meet friends while enjoying a cocktail. It’s all about seafood at Crabby Dan’s. The freshest seafood beautifully prepared in variety of styles that will be sure to please the pickiest palate. Be sure to try our fresh lump crabmeat Crab Cakes. These two filler free beauties are brimming with lump crabmeat through and through! In the mood for something different? Be sure to try the Conch Fritters, deliciously light, served Bahama Style with a piquant Horseradish Sauce. Sweet and luminous clams and oysters are available on the half shell. In the mood for soup? The New England Clam Chowder is thick and creamy, the Manhattan Style hearty. Lobster Bisque is rich and flavorful. Some of Crabby Dan’s signature dishes include Seafood Fra Diavolo. This pasta dish is chock full of mussels, clams, shrimp, scallops and Calamari in a spicy tomato sauce. A hearty piece of tuna comes chargrilled rare and served with a delightfully tropical pineapple salsa. The Chilean Sea Bass is another lightly cooked treat. Either topped with fresh veggie or the flavorful homemade pesto, it is a must try. For the land lovers, there is a varied menu that includes Chicken Francaise, BBQ Baby Back Ribs, Twin Filet Mignon, Blackened Chicken Breast or Burgers. All are highly recommended. Entrees are served with choice of potato and salad. Crabby Dan’s wine list is well thought out and extensive. Wine may be ordered by the glass. For the beer lover, there is a varied selection of imported beers. In the summer, there is a charming, secluded area for al fresco dining. Service at Crabby Dan’s is warm and friendly, the food prepared fresh to order. With this winning combination, Crabby Dan’s will be sure to become one of your favorite restaurants.